The arrival of fall brings the countdown to many welcome familiarities — piles of raked leaves, holiday cooking and Cosby-esque sweaters. This year's leading interior-design color motifs are pairings of warm and natural earth tones or neutral and bright jewel tones — which are particularly reminiscent of fall but perfect any time of the year. Wine-inspired reds, chocolate browns and plums are trending for those with a warm aesthetic; grassy greens, French violets and sulfur yellows for those of the cool-color persuasion. Natural earth and bright jewel tones are trending in homes this fall. We're seeing happier colors across the board. One design tack is to go with bright colors for a happier look. During harder economic times, people seem to have adopted a caution-beats-costly attitude, which means many homeowners are staying in place rather than buying a new home. Interior decorators, as a result, say they are being called on to revamp owners' old spaces. "People are being very wise with their investments," says Sonu Mathew, senior interior designer for Benjamin Moore & Co., a leading paint manufacturer. "They are making their homes more livable and comfortable rather than moving." Garrison Hullinger, president of Portland, Oregon-based Garrison Hullinger Interior Design Inc., says around 80 percent of his clients are second-time or third-time homeowners who for the first time are employing the services of a decorator. Virtually all of his customers are using his services to revamp the living room and the master bedroom. Homeowners like to change the interiors of their homes just as they enjoy the outside changes of the season, Mathew said. The overall trend this fall, decorators say, is to create happy spaces and cozy luxury. "We're seeing happier colors across the board," said Jason Ball, principal designer of Jason Ball Interiors, also of Portland. "When there is some economic downturn, the result is to make interiors less gloomy." Enter jubilant reds, gleeful greens, harvest golds, lively browns, captivating purples, and — heading into 2012 — blissful blue undertones. Additionally, textures such as natural wood for furniture and flooring, and gray stone counters or stone details create contemporary lines and present a tone of rustic, rough-hewn modernity that is growing in popularity. "The dark, ebony-stained woods are going away in favor of lighter natural woods with lighter finishes, like teaks and walnut and even whitewash," says Hullinger. "People are looking for simple, graceful lines." Hullinger, who has projects in Washington, D.C., Connecticut and Florida in addition to his work on the West Coast, says the times of heavy ornamentation, sponging and baroque patterns definitely have moved out of fashion. "Anywhere you go, the days of Vegas are over," said Hullinger. The methods for updating your home's décor and incorporating the season's colors range from repainting to refurnishing to adding accents such as decorative pillows, rugs, artwork and bedding. Venetian plasterings as well as patterned and textured wallpapers also have become popular, says Hullinger, citing grasscloth, which is a woven wallpaper. Compared to buying new furniture, repainting is a fairly easy and cost-effective way to revitalize a space, which makes it a popular choice, says Mathew. 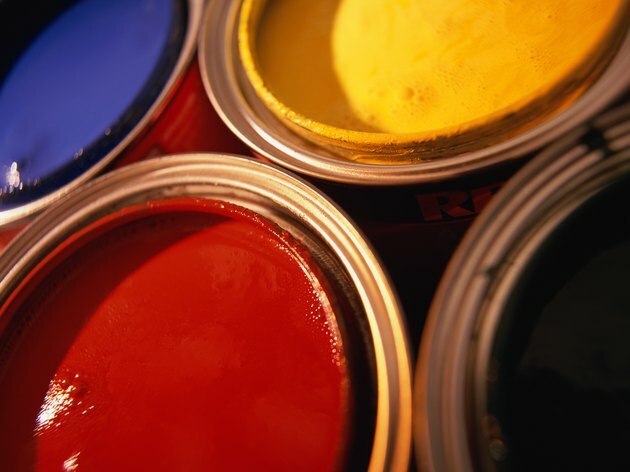 A gallon of paint covers about 400 square feet and a wide range of paint qualities are available. It's also easy to repaint furniture and give it a whole new life, something that renters may engage in quite easily and inexpensively. Many factors drive interior color trends, not just the biggies, such as fashion and national mood. "Color happens in context," says Mathew. Where people are shopping, what materials are available, architectural styles, native foliage, landscaping and personal tastes are all variables for homeowners when choosing shades. Colors can have specific regional qualities because of some of these factors, but they are not necessarily dictated by architectural styles. Mathew says she consistently sees an intermingling of themes — traditional pieces with Asian-inspired motifs or Greek revival homes with modern pieces. "There is a blending of styles happening," said Mathew. "Whether it is because of more mixed families, better global understanding and awareness, personal travels, I'm not sure, but it is happening more and more." Ball says people should not be worried about following a certain trend because of regional or architectural themes. "You could probably take any house I've done and put it in any other region," said Ball. "There may be some (pairings) that are difficult, but it's just a matter of thinking, 'OK, how do we do this.' And it all comes down to proportion." For example, if your preferred style may clash with the architectural theme of your home, incorporate a few statement pieces instead of going all out in that contrasting style, Ball said. Every season has its new flavor but decorators say the No. 1 rule by which homeowners should abide is: Stick with your core preference. Do not overindulge the latest trend if it is contrary to your true palette tastes. "Start with what you love," says Mathew. "The most important factor when deciding (color palette) is what works for you. Look for ways for change but without changing the reflection of who you are." Fall's indoor color trends embody a warm and inviting palette. But what about your home's exterior paint job? Benjamin Moore suggests several shades for varying architectural styles according to U.S. region. Take that advice or follow your heart, as decorators say: Decisions should always be made according to what you prefer. — Try a tawny maple tone offset with deep brown shutters and off-white trim with a burnished red door to add an upscale look. — Maybe a light gray with charcoal shutters and mascarpone trim better suits your tastes. 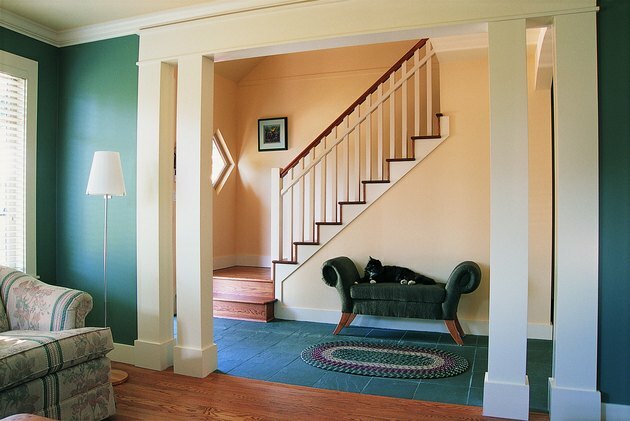 — Try a flaxen yellow shade with soft white trim and a stately green door for contrast. — Give it a go with a misted green exterior with white dove trim and a classic brown door for contrast. — Cozy yellow with bright white trim and deep green shutters fit the fertile, farm-belt sensibility. — Maybe a neutral palette with accent tones of deep blue-gray on the shutters is a fresh start. — Try contrasting shades of gray paired with black shutters and an off-white trim. — Go for a blue-hued beauty with three complementary shades of blue on the body, upper body accent and shutters, and white trim. — Opt for a light, creamy pink with warm brownie trim and pale blue accents. — Muted earthy tones like a salmon for the body and white trim mimic the Southwestern terrain while an accent of Colonial blue gives a pop of color to the palette.